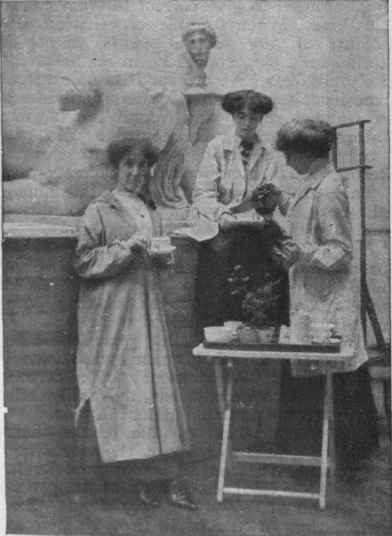 May, 1910, in a specially designed and splendidly fitted building, containing a set of fine studios, at 70, Campden Street, Campden Hill, W., by Mr. Byam Shaw and Mr. Rex Vicat Cole, two of the most brilliant of our younger artists. It has already become a highly flourishing school, with an attendance of over forty students, and the chance visitor to the school is struck by the youthful spirit of energy and artistic enterprise which animates students and teachers alike, and which is a most stimulating and refreshing thing to meet with. To the girl art student a peculiar attraction in the teaching lies in the fact that the chief object in the course of training is to stimulate the young artist's own originality, and, by constant change of work and of models, to avoid any possibility of staleness or monotony in the daily round of work in the studios. School working hours are from 10 to 6, with a break of an hour for luncheon and a short rest for tea, except on Saturdays, when the school closes at 4. During the morning hours, from 10 to 12.30, all girl students who are sufficiently advanced work in the woman's life class, under the direction of Mr. Byam Shaw himself. From 1.30 to 4 p.m. a costume model poses, while from 4.30 to 6 there is a draped model sketching class held in the biggest of the studios for the entire school, men and girl students working together. 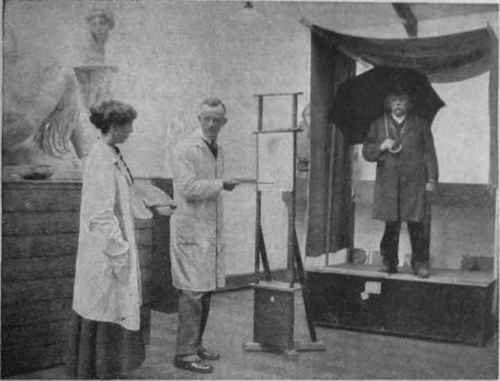 A fresh model sits every day, posed with different accessories, under different effects of light, with the object of encouraging students to sketch general effects rapidly and to depict objects in action. With these ends in view, all sorts of original accessories have been introduced into the studio. A hammock in which the model was gently swaying to and fro, and a swing with a child to be painted engaged in more vigorous action, were among the subjects which lately occupied the sketching class. Mr. Vicat-cole has excellent schemes for obtaining original effects of lighting. A big cupboard door, leading down to the cellars below, has been pressed into service on one or two occasions to provide an admirable setting for a model posed peeping from the shadow of the open door with a brilliant light behind her, giving the weird effect of some tantastic witch's cave. Round the studio wall runs a narrow shelf beneath which is a most interesting and highly varied collection of vivid arresting students' sketches, each of which. While showing much individuality and character in its treatment, is obviously painted with a keen appreciation of the necessity of depicting every object in relation to its immediate surroundings, important point which both Mr. Byam Shaw and Mr. Vicat-cole are never tired of impressing on their pupils. 'many otherwise excellent modern portrait is entirely spoilt by the hopeless way in which the clothes are painted." as Mr. Byam Shaw remarked, and the art of how to paint both historic and modern costume has, therefore. been made a special feature of instruction at the school. Both the princi-pals are strongly in favour of students working from the draped lay figure, so as to learn how to give full value to contrasts of texture and material without the necessary interruptions for the model's rests - ten minutes in an hour. Medieval Dollmr. Byam Shaw himself is. as all picture lovers know, a great student of mediaeval times, and many of his fine mediaeval costumes have been put at the disposal of the students for study. On Saturday mornings the students' weekly unsigned exercises in composition, executed in black-and-white, on a given theme, as, for instance, "Isabella and the Pot of Basil," are pinned up in a row in one of the studios for criticism by Mr. Byam Shaw, whose own brilliant illustration work makes him a most helpful critic of his pupils' often very ambitious attempts to portray some difficult subject. His comments are keen, yet always kindly, and his humorously apt remarks and suggestions are received with enthralled attention by the group of young artists who, from a respectful distance, surround him. and hang on his words as he passes from one drawing to another and returns finally to the best picture of the week to pay it a highly coveted compliment with the remark, "I should like to keep that, please!" But sketches are kept to be criticised by one of the visitors at the end of the year.